Experience spectacular country Victoria by air! Welcome to the Heart of Victoria – the Goulburn River Valley region. Discover the wonders of nature that make the region so special, including the mighty Goulburn River. Experience art and culture and soak up the history and heritage of the region. Partake in the great local produce and some of the best wines you can find. Have fun with the family, get active in the beautiful outdoors, or indulge in a little retail therapy. Enjoy a day trip or stay awhile and experience all that is on offer. From Marysville to Alexandra, Eildon to Yea and Kinglake; Kilmore, Tooborac and Seymour, Nagambie and Euroa; Shepparton and its many wonderful surrounds, every destination and everything in the Heart of Victoria waits to welcome you. Tour de Senses arranges private & exclusive bespoke experiences for up to 11 people in the Goulburn River Valley, showcasing the region to both locals and visitors. From skydiving to wine tasting there is something for everyone in the heart of Victoria. All tours can be tailored to suit your needs so please ask when booking if there is anything you would like to add or change. We also offer a local charter service in the Nagambie region (and surrounding towns) including airport transfers. Contact us here for more information and to make a booking. Visit and enjoy a private wine tasting at the three most well-known wineries in the region: Tahbilk, Mitchelton, Fowles and visit a working Boutique winery, Wine x Sam. 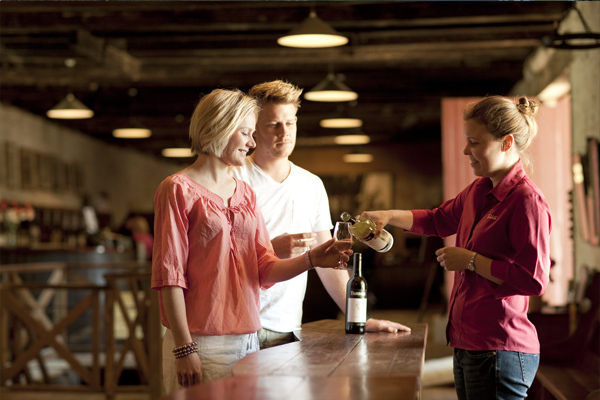 This tour includes lunch with glass of wine, tastings and local produce platters. Thank you, Mel, for a fantastic day! Being picked up from home & dropped off at home was great.Your choice of wineries was exceptional and you looked after everyone so well. Lots of laughs! !